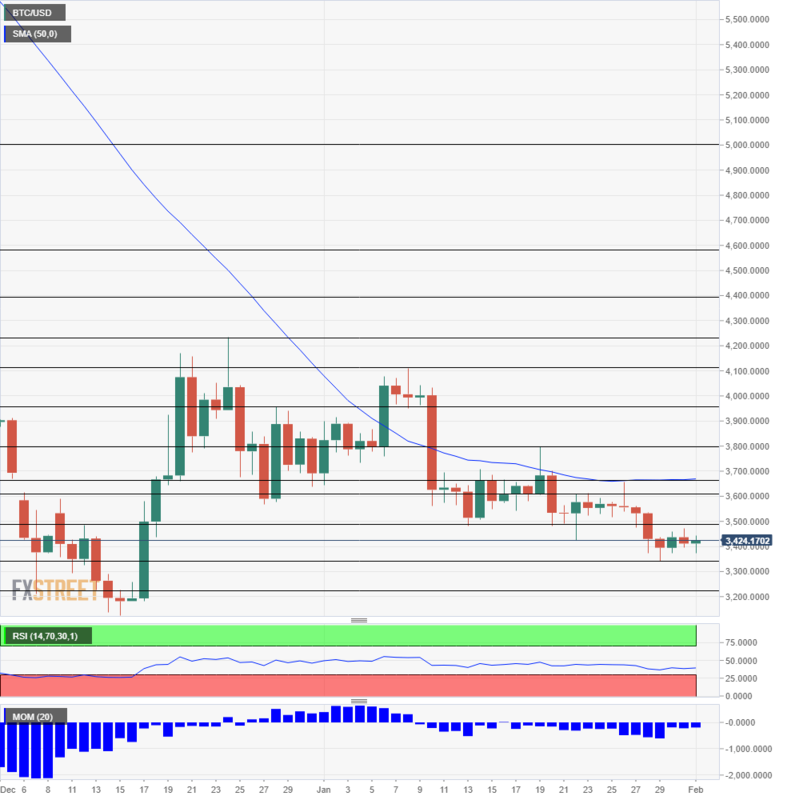 Bitcoin Top Price Prediction: Double-Bottom Is A Bullish Sign, BTC Finally Bottoming Out? Bitcoin begins bottoming out after a gradual decline. The SEC is reportedly warming to approving a Bitcoin ETF. The technical picture is improving for BTC/USD and experts are mixed on the next direction. After extending their grind lower, cryptocurrencies are on the move once again. BTC/USD stopped the bleeding at the double-bottom and began rising. Ethereum and Ripple lead the current recovery and the granddaddy of cryptocurrencies may follow suit. It is not only a matter of technicals and flows. Fundamentals may be in play as well. SEC Commissioner Robert J. Jackson Jr. gave an interview to the Congressional Quarterly and said that the SEC will eventually approve an Exchange Traded Fund on Bitcoin. He thinks that at some point somebody will satisfy the standards set on the regulators. Not all the news has been helpful. The plot around the demise of QuadrigaCX, Canada’s largest crypto exchange continued thickening. Access to the exchange’s cold storage is reportedly lost with the death of founder Gerald Cotten. Some suspect he is not dead and others suspect there are no funds in the cold storage. Events are unfolding thick and fast, and the headlines are not helpful to crypto prices. Another unfortunate story is that of a fake website that presents itself as the highly anticipated Bakkt platform and tries to scam users. The fake outfit presented a timeline for the launch of the institutional offering and wooed investors to chip into its success. so far, it seems that the scam has failed. Nevertheless, stories relating scam to cryptos do not support price rises. As mentioned earlier, $3,330 is a double bottom. As the daily chart shows, BTC/USD hit the price on January 29th and again in early February. During January, Bitcoin set lower lows every few days. The bears’ failure to push prices lower is an encouraging sign for bears. However, the road is long. 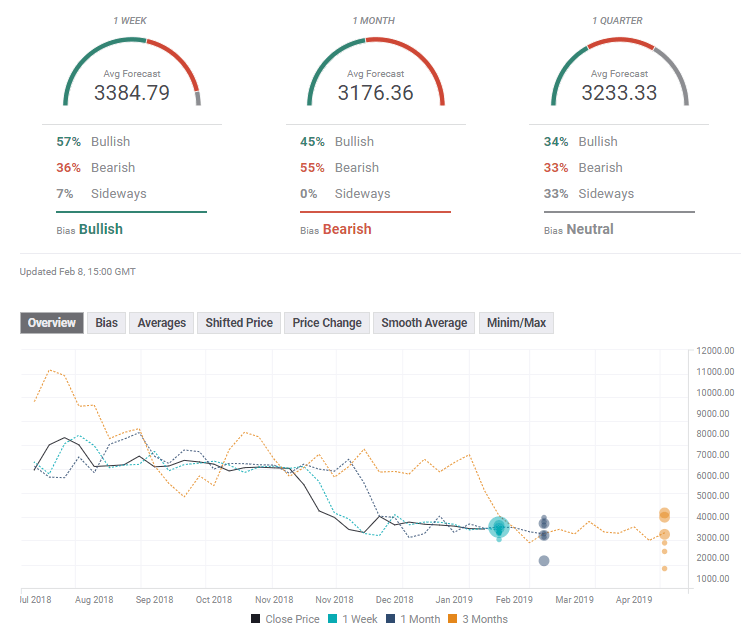 BTC must first surpass the February highs around $3,500 in order to begin setting higher highs and set an uptrend. The next line to watch is $3,610 which was a cap in late January. It is followed by the $3,660 swing high seen around the same time, and also coincides with the 50-day Simple Moving Average. $3,800, recorded in mid-January, is the next target. Below $3,330, $3,210 is notable after it stopped a downfall in early December. The next line to watch is the cycle low of $3,125 recorded in mid-December. The round number of $3,000 is next and was last seen in the summer of 2017. The Forecast Poll of experts shows optimism in the short term, a bearish trend in the medium term and a neutral one afterward. Forecasts have not moved much in the past week.